A large character area lying to the south of the Milford Haven Waterway. It includes the ecclesiastical parishes of Pembroke St Mary, Cosheston, Monkton, Nash and Upton, all of which lay within the medieval Lordship of Pembroke, and Carew parish, of the medieval Barony of Carew. Most of the present farms and landholdings can be identified with medieval manors, which were however subject to a complex process of division and sub-infeudation following the break-up of the Earldom of Pembroke in 1247. The part of Pembroke St Mary parish that is situated in this character area once lay within the Manor of Kingswood with Golden, which was a demesne manor of the Pembroke lordship. Here arable land-use is recorded, in detailed accounts from the 14th century and 15th century, with issues from wheat, beans, peas, barley and oats. However, meadowland, sheep and wool are also recorded, as well as profits from cloth processing – two fulling-mills were established here during the 15th century. Later in the post-medieval period, the manor became part of the Bush estate. Bangeston, also in St Mary parish, is probably the ‘Benegareston’ that comprised 1/10th knight’s fee held of the lordship, by John Beneger in 1324. A chapel at Upton was recorded by Giraldus Cambrensis in c.1200, and was normally subordinate to Nash parish. The Manor of Upton was a castle-guard fee of the Lordship of Pembroke, and had merged with the Manor of Nash by the 14th century under its tenant lords, the Malefants, who built a small stone castle at Upton. The ‘Manor of Upton and Nash’ had descended to the influential Bowens by the 16th century. Cosheston manor, recorded in the 13th century, was another castle-guard fee, comprising 2 knight’s fees held by the Wogans of Picton and Boulston in 1324. The area includes a small part of Monkton parish, held by the Benedictines of Monkton Priory, Pembroke. Vills were also recorded at Brotherhill, Mayeston and Paskeston between the 13th century and the16th century. The various ownerships appear not to be reflected in differing tenurial arrangements, and a homogenous pattern of large, enclosed, irregular fields exists, with little evidence of former open field systems. Some of the enclosure appears to have been established over former woodland – Upton and Nash are included in George Owen’s list of the greater woods of Pembrokeshire in c.1601. However, the eastern part of the area, within the parish and medieval Barony of Carew, exhibits a slightly different pattern. This area, formerly part of Carew demesne, is laid out in a system of large regular fields. The creation of some of these enclosures can be attributed to the 16th century lord Sir John Perrot, as they are recorded in a survey of 1592 following his attainder to the barony. Some subdivision had occurred by the time of the tithe survey of 1839. The caput of the barony, at Carew Castle, lies within this area. Extensively rebuilt under Perrot in the late 16th century, it was abandoned during the 17th century. The settlement at Carew has medieval origins, as has Carew Cheriton, the ‘church town’ - a separate settlement around the parish church of St Mary - which lies some distance from the castle. Milton, with its medieval mill site(s), represented 1 knight’s fee held of the Barony, in 1362, by the Malefants. The village is probably medieval in origin; the mansion house, however, is de novo from the 18th century. Welston Court represents a former holding of the bishops of St Davids. Although the area has remained overwhelmingly agricultural it does include part of the Milford Haven waterway foreshore, which has always been important in defining the area’s character. Jenkins Point, in particular, was an important shipping place, with early landing stages for the Benton and Lawrenny Quay ferries. The surrounding 18th century and 19th century settlement has created a distinctive pattern of small fields and numerous dispersed dwellings. Estate maps of the late 18th century and early 19th century and tithe maps of c. 1840 show that the landscape of today had already been established right across this area. Only minor changes have taken place since then, such as a slight increase in the number of dwellings along the waterway and the establishment of Cosheston Hall and Park over what once had been fields. This is a relatively large historic landscape character area lying to the south of the Milford Haven waterway and the Carew River, to the east and south of Pembroke Dock on undulating ground lying mainly between 20m and 50m above sea level. Mud flats, marsh and the rocky foreshore along the Milford Haven waterway are included in this area. It is an agricultural landscape of large, dispersed farms and large fairly regular fields. There are a large number of listed buildings within this area. Several of them are major houses including the ruinous medieval castle of Carew with its massive Elizabethan wing, Upton Castle with a disused chapel set in parkland and gardens, Cosheston Hall with its parkland, Bangeston Hall, Welston Court, Milton House, Holyland Hotel and the Fortified Rectory at Carew Cheriton. Clearly a vast date range and many building types are included within these structures, from medieval defensive sites through to Victorian mansions. They are united in providing an estate quality to large tracts of the landscape, with parkland, stands of deciduous woodland, lodges and home farms. Farmhouses on the home- and other substantial-farms are generally in the Georgian tradition, stone-built and cement rendered with slate roofs, associated with which are ranges of stone-built outbuildings, sometimes arranged semi-formally around a yard, with large modern agricultural structures nearby. Smaller farmhouses are also mainly 19th century and within the Georgian tradition. There is a dispersal of 19th century and 20th century houses close to the shore of the waterway, but Milton and Carew are the only significant nucleations. Milton comprises stone-built vernacular houses, cottages, a public house and farm buildings, on the outskirts of which is a late 20th century housing estate. Carew is essentially a linear village with a terrace of 19th century houses, a ‘Flemish’ chimney – the remains of a sub-medieval house –, a 19th century chapel and 20th century houses. Carew bridge, and the French Mill (an imposing Georgian building, but described as a ‘French Mill’ in 1541) and its dam, an early medieval high cross, together with the castle and the village represent an important assemblage of structures within Carew. Carew Cheriton is a loose cluster of buildings, including the Fortified Rectory and an Old Mortuary Chapel, which is dominated by the St Mary’s medieval church. The small church at Nash is also in this area, and a dovecote north of Monkton Priory. Agricultural land-use is improved pasture with a little arable. 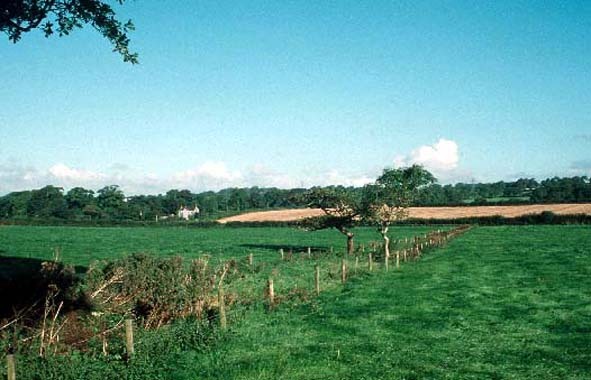 Fields are relatively large with boundary banks of earth topped with hedges. Hedges are generally well maintained, but some are overgrown and others support mature trees. These trees, together with woodland close to some of the large houses, in the parkland, on steep valley sides and along the banks of the waterway add to the estate character of the area. The main transport routes are narrow winding lanes, but both the A 477(T), to Pembroke Dock and the A 4075 cut across the area. There has been very little degradation of the historic landscape components where this area borders Pembroke and Pembroke Dock urban character areas. Archaeological sites are varied. The most numerous are World War 2 defensive structures – gun emplacements, searchlight batteries etc – followed by industrial sites, which are mostly quarries, and limekilns. Both coastal and inland kilns are present. Other sites include caves and find spots of prehistoric artefacts, bronze age standing stones and bronze age burnt mounds, a holy well site and several sites of mills. Although well defined against the Milford Haven waterway, Carew Airfield and the two urban areas of Pembroke and Pembroke Dock, this historic landscape character area has poor definition to the south against an area that has yet to be characterised. Here there is a wide zone of change, rather than a hard-edged boundary.